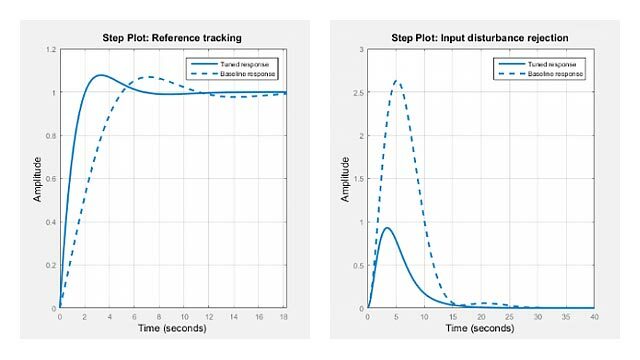 [Gs,Gf] = freqsep(G,fcut) decomposes a linear dynamic system into slow and fast components around the specified cutoff frequency. The decomposition is such that G = Gs + Gf. [Gs,Gf] = freqsep(G,fcut,options) specifies additional options for the decomposition. Load a dynamic system model. Pd has four complex poles and one real pole. 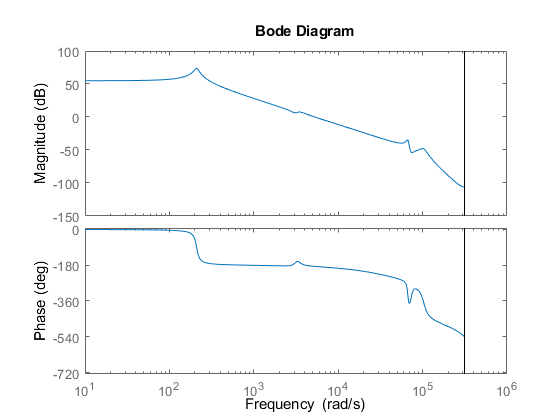 The Bode plot shows a resonance around 210 rad/s and a higher-frequency resonance below 10,000 rad/s. Decompose this model around 1000 rad/s to separate these two resonances. 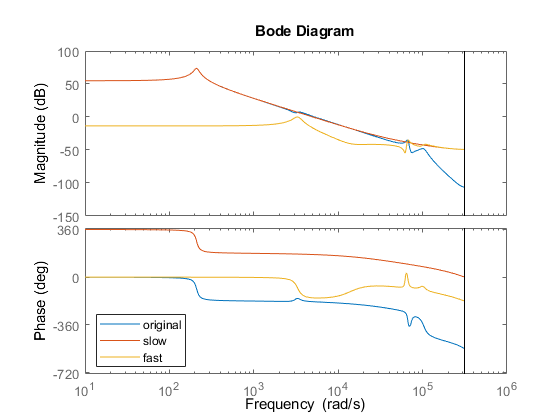 The Bode plot shows that the slow component, Gs, contains only the lower-frequency resonance. This component also matches the DC gain of the original model. The fast component, Gf, contains the higher-frequency resonances and matches the response of the original model at high frequencies. The sum of the two components Gs+Gf yields the original model. Dynamic system to decompose, specified as a numeric LTI model, such as a ss or tf model. Cutoff frequency for fast-slow decomposition, specified as a positive scalar. The output Gs contains all poles with natural frequency less than fcut. The output Gf contains all poles with natural frequency greater than or equal to fcut. Options for the decomposition, specified as an options set you create with freqsepOptions. Available options include absolute and relative tolerance for accuracy of the decomposed systems. Slow dynamics of the decomposed system, returned as a numeric LTI model of the same type as G. Gs contains all poles of G with natural frequency less than fcut, and is such that G = Gs + Gf. Fast dynamics of the decomposed system, returned as a numeric LTI model of the same type as G. Gf contains all poles of G with natural frequency greater than or equal to fcut, and is such that G = Gs + Gf.